Hot on the tails of the recently released Clavinova CLP600 range comes a brand new, ground-breaking digital piano - the Yamaha CSP Clavinova series. This is a digital piano that is controlled almost entirely from your tablet or smartphone. At first glance, the Yamaha CSP looks like a cross over instrument between the CLP and CVP series Clavinovas. It has a fully weighted keyboard action and, when used alongside the Yamaha Smart Pianist app, has a ton of features. There are two pianos in the Yamaha CSP range - the CSP150 and the CSP170. Both pianos are available in Black, White and Polished Ebony. First and foremost, the Yamaha Clavinova CSP is a digital piano. With a fully weighted action, the keys feel heavier at the bottom and lighter at the top - like they do on an acoustic piano (and indeed, like the rest of the Clavinova series). The keys are made from synthetic ivory and synthetic ebony to give an authentic touch. You can also use the piano without a phone or tablet and take advantage of the piano sounds already built in - samples from the world renowned Yamaha CFX and Bosendorfer Imperial concert grand pianos. Also, like the CLP635 upwards, the CSP has VRM (Virtual Resonance Modelling) which digitally recreates all the mechanical resonance that you get from the pyhsical act of playing keys that let hammers hit strings on an acoustic piano - it result in a much richer sound. 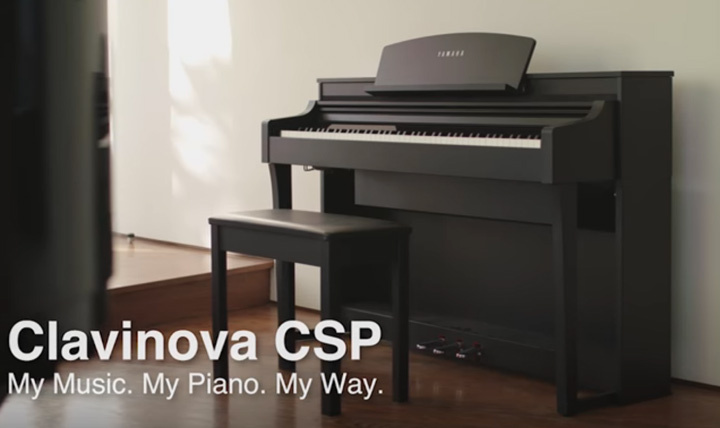 When you connect the Yamaha CSP Clavinova to your phone or tablet, you've got a massive range of capabilities. First off, you can choose from a wide range of voices - different pianos, synths, strings, organs, guitars, horns etc. If you've ever heard the Super Articulation voices on the CVP Clavinovas, rejoice because the CSP has them too. Super Articulation voices recreate all the subtle nuances that you get from a real person playing an acoustic musical instrument eg. fret noise on a guitar, glissando between notes on a sax. Basically, you've got a load of very realistic sounds that you can get out of the piano - more so than the CLP600s. If you've seen the Piano Room function on the CVPs, you know how much control this gives you in terms of sculpting your sound. Using the Smart Pianist app alongside the Yamaha CSP, you can make virtual adjustments to your piano and the room that it's in until you get the tone that you're after. If you want it brighter, more mellow, with more reverb etc - you can do it all and then save your favourite settings for easy recall. Similar to the CVP series, the Yamaha CSP Clavinova also allows you to play with a virtual band, choosing from hundreds of accompaniment styles. It follows the chords you're playing and applies those harmonies to the virtual band. It also tracks the velocity at which you're pressing the keys so that the band can follow your dynamics too. If you're more of a solo player, the Yamaha CSP also has a microphone input to sing along with, and apply reverb and other effects to your voice. One really impressive feature the CSP has is the intuitive Scoring function. If you have songs on your music library within your phone or tablet, the app can create music notation for them so that you can play along. You can even choose what kind of score you get depending on your playing level. Having had a look at them at a Yamaha event, we can't wait to get them in store! We were impressed by the spec but having seen them in person, they really are incredible instruments - definately check them out when they're in.